Some of Aberdeenshire’s most outstanding young people were celebrated last night at a legacy event to mark the Year of Young People. Those attending at Meldrum Academy enjoyed showcases of some incredible accomplishments over the last year, as well as a series of performances and presentations and an opportunity to find out more about youth services in Aberdeenshire. A summary of the year’s events was showcased in a film clip, while guests were also able to see and hear 52 evocative ‘Youth Voices’ recordings. The project gave participants the opportunity to tell the world what matters most to them and explain by podcast, vodcast or in writing what it is like to be young in Aberdeenshire. Education and Children’s committee chairwoman, Gillian Owen attended the event and summed up the “fantastic success” of the past year. She said: “It has been a real privilege to observe the talents, achievements, energy and enthusiasm of the young people across Aberdeenshire. 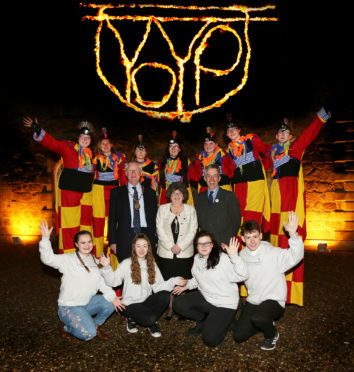 Some of Aberdeenshire’s most outstanding young people were also invited to present and perform at last night’s celebration. They included Aboyne Academy pupil Clara Gray, 17, who spoke about her experience as a human rights defender after she was invited to Paris to interview the UN special representative on violence against children. Clara was chosen to represent Scotland in the European Network of Young Advisers and travelled to the French capital for a mental health conference. She said: “I feel like we live in a bit of a bubble in Aberdeenshire and I got to escape that for a little bit. Josh MacRae, 16, attends Inverurie Academy and is a Scottish Parliament member, having been interested in politics from an early age. Last night he said he had just wanted to “make a difference”, adding: “I realised the power in a group of volunteers coming together for a common cause and I wanted to be part of that.